Description: Give us your perceptions of people! 10:30pm should I have that extra chicken strip in the fridge? They were really good and I'm tempted. Description: We have 18 pictures. For each picture, you're asked to rate how it is related to 5 verbs. Glad I caught up on the thread...I was wondering what the influx of love was all about. You've received a bonus from Psychology Research for work related to 388CL5C1RKBVO8I3XTJ6MB1FPYUHLO. Thank you for your participation in the Sudoku Puzzle Experiment. We noticed that the task took longer than expected and increased the bonus. We are fortunate to have the MTurk community that can support our research. Please continue to support the works of other scientists as well! 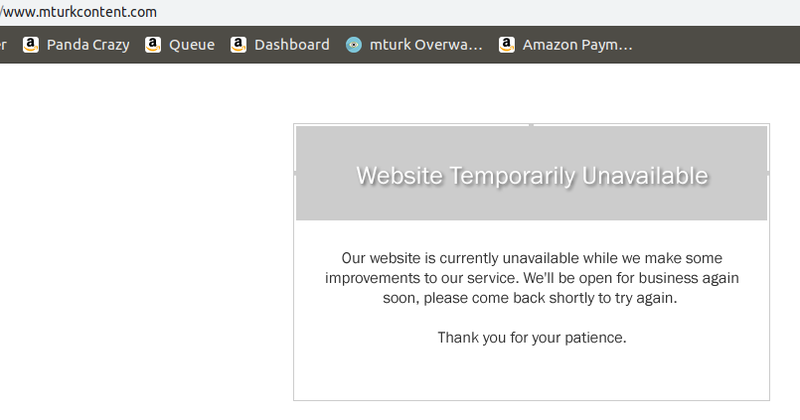 We can’t connect to the server at www.mturkcontent.com. Hello son. You missed supper. It was. I saved an extra plate in the fridge.